Laidback, easy going but adventurous and spirited, the juxtapositions associated with inhabitants of “The Land Down Under” apply to a yacht charter in the Whitsundays. Above the surface of the water a chain of 74 islands snake across the turquoise waters in a sea of green and white. Below the surface is an entirely other world. The Great Barrier Reef lies below water’s meniscus and teems with vibrant colours and life from coral and fish to larger and more intimidating specimens. Relatively untouched, the virginal land is home to an unbelievable range of flora and fauna that flourish on the lush islands. Abundant in activities, spend a day on Whitehaven beach, one of the most beautiful in the world, dance until dawn on the shores of Arlie beach or dive, dive, and dive some more. Sailing slow on a Whitsunday morning, you’ll never want to leave. Fly into Hamilton Island’s airport and meet the yacht at the Hamilton Island Marina. Your first stop is the Great Barrier Reef. Spend the next two days exploring the world’s largest coral reef system by yacht tender, helicopter and seaplane — all of which are found on Hamilton Island. If the weather permits, cruise south from Hamilton Island, passing Pentecost Island, to Straw Island. East of Burning Point, you’ll find an anchorage protected by a wide coral reef. Spend a castaway day on, secluded and picturesque, tender ashore for some fun in the sun. Enjoy an alfresco breakfast as you cruise Solway Passage. Arrive at Whitehaven Beach and be blinded by the luminescence of the 98% pure white silica. Protected by the Whitsunday Islands National Park, revel in one of the world’s cleanest beaches. Take the tender ashore to walk up Hill Inlet and be privy to breathtaking panoramic views overlooking Whitehaven Beach. One of the top 3 places to snorkel in the Whitsundays, grab your gear and explore the coral shelf. Inquisitive fish will swim alongside you as they haven’t developed the fright of those that live near populated shores. A eucalyptus forest sits above land on Cateran Bay while below keep an eye for dangerous box jellyfish. For land lubbers, check out the antique churches on the island. Cruise through the Hook Passage, which is the dividing line between the Hook Islands and Whitsundays, to the Nara Inlet. Take the tender to the eastern shore of the inlet and walk the trail leading to prehistoric aboriginal cave drawings and a magnificent waterfall. For more history, visit the recently developed Ngaro Sea Trial cultural site to learn more about the regions native inhabitants. 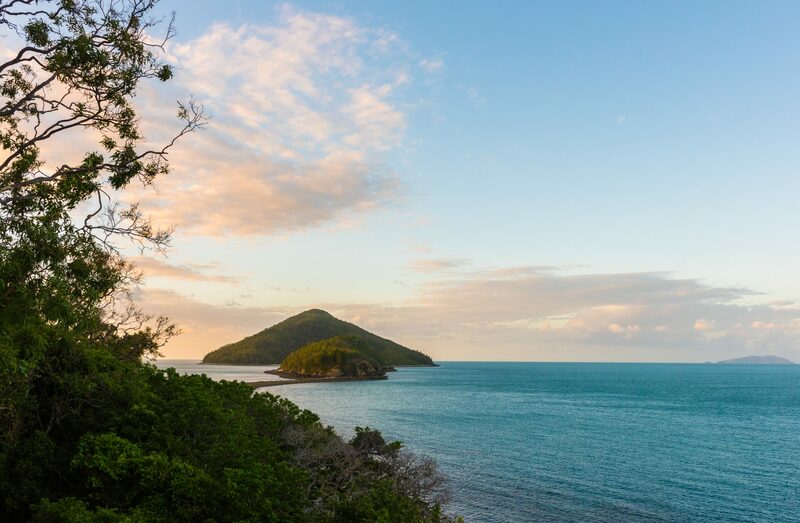 Between Hayman and Hook Island you’ll come across Butterfly Bay, a secluded anchorage. From here, take the tender to Manta Ray Bay to find some of the Whitsunday’s best snorkeling and diving. If you seek a little luxury, visit the One&Only Hayman Island, which offers a signature signature Ocean Dreaming Massage, sunset cocktails, and a selection of fine-dining restaurants.